“THE REAPER NIGHTMARE TOURNAMENT SERIES | 死神の悪夢トーナメントシリーズ” is an online fighting game competition held by RoKtheReaper.com. The atmosphere and competitive environment is meant to give the feeling of an in-person tournament from the comfort of the participants home. The tournaments will span across different games as they release and happen primarily through the week as opposed to the weekend. As new fighters come out, we will change to that series dependent upon what it is and if there is enough online support for a healthy, weekly scene for competition! I have found that most tournaments for fighting games are held during the weekends, that includes both in-person tournaments and online tournaments alike. However, many people (like myself) work during the weekends or have other responsibilities, therefore we cannot taste a tournament-like competition unless we devote time off from work or similar responsibilities. 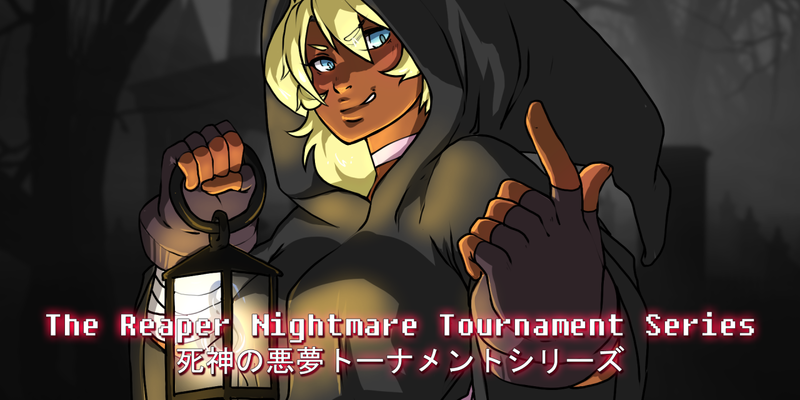 THE REAPER NIGHTMARE TOURNAMENT SERIES | 死神の悪夢トーナメントシリーズ aims to be a hub for these types of people who want to compete during the week without worrying whether-or-not they have a local scene they can attend that may be holding an event during that time. The current fighter is BlazBlue: Cross Tag Battle「ブレイブルー クロスタッグバトル」on Playstation 4. Here lies all of the previous 1st place winners of the THE REAPER NIGHTMARE TOURNAMENT SERIES | 死神の悪夢トーナメントシリーズ. I have included their name, the character(s) they used to win, as well as a link to the results of tournament they reigned victorious in (which you can access by clicking on “Tournament” directly to the right of each bullet point).